The time has come for us to go our separate ways. May everyone have a great holiday break and come back refreshed and rejuvenated, ready for another (maybe your last?) semester of school. If you happen to be sticking around Austin, however, I am sure you will be looking for something amazing to do for New Year’s Eve. I’ve never stayed in the city for the holidays, so I can’t vouch for anything, but hopefully one of these options can provide some fun for you. Happy holidays! It’s been a pleasure writing for you. Sister Hazel is playing at La Zona Rosa Dec 9 at 9 pm. Think back to the mid-to-late ’90s and imagine a world where “All For You” and “Your Winter” topped the chart. Does this bring a smile to your face? Then you really need to put the books down and head to this show. They’re touring to promote their latest album “Release.” Tickets are $10 and only available the night of the show at the door. Good luck with finals everyone! Hope this list could help you procrastinate a little bit and reminisce about when school was much much easier. Monday night marks the annual UT tradition of the Hex Rally. Each year, the university comes together to root on their football team against Texas A&M. This pep rally dates back to 1941 when a local fortune teller advised university students to burn red candles the week leading up to their game in order to break the “jinx” A&M had put on the UT football team. Of course, the Longhorns won the match-up and the tradition has stuck ever since. This year’s rally will feature speeches from head football coach, Mack Brown, strength and conditioning coach, Jeff “Mad Dog” Madden and players from the team. 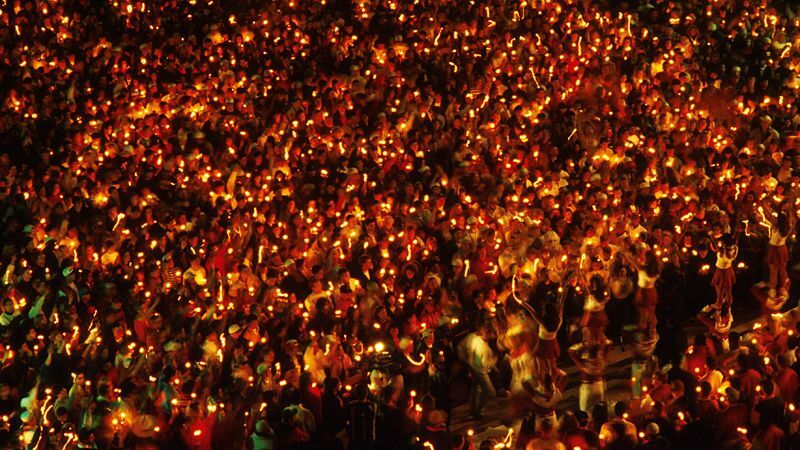 Tthe Longhorn Band, Texas Cheer and Pom, Redefined Dance Company, and the Ransom Notes will perform before the ritual of lighting those red candles. Why should you attend this year’s Hex Rally? Besides the fact that our football team is awesome this year and has a shot at going to the National Championship, Emmily Attyah, UT sophomore and the co-director of special events and rallies for Texas Exes Student Chapter gave me various reasons why she loves the rally and thinks everyone should attend. As co-director of special events and rallies, Attyah plans both of the main pep rallies at UT (against Oklahoma and Texas A&M). Her job involves designing a t-shirt for the event, booking an emcee, notifying student organizations, planning with the football team, designating the space, leading her committee, finding the candles, and creating a playlist for the preshow. “There is a lot of work, communicating and planning that goes along with this job,” she said. Attending the Hex Rally should be on the list of things every Longhorn should do at least once. Head over to the Main Mall tomorrow night at 8 pm and put a Hex on A&M. Texas Exes Student Chapter will be hosting an after party at Austin’s Pizza on the drag immediately following the rally. Here is some video I took of our bartender at the South Austin Trailer Park and Eatery re-opening event that I talked about the other day. She explained to us what the event was for and how to make Liquid S’mores cocktails. Come down to South Austin Trailer Park and Eatery on South 1st St. and eat food from Man Bites Dog, Holy Cacao, and Torchy’s Tacos for a good cause. Tonight, November 19, from 6:30-9 pm, 10% of all their proceeds will be donated to the families of Fort Hood victims. In addition to Holy Cacao unveiling their holiday cake balls, they will be serving up free “Liquid S’Mores” cocktails made with Dripping Springs vodka and 1921 tequila. Man Bites Dog will be making their official debut on the trailer food scene with their gourmet hot dogs. The event itself is free and requires no RSVP. Check back this weekend for video from the event! 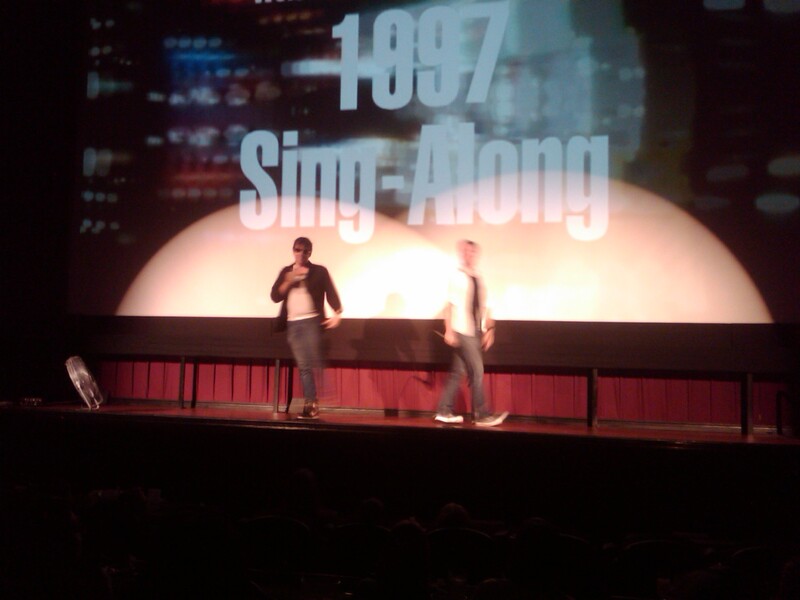 On Thursday evenings, Alamo Drafthouse’s downtown location, The Ritz, hosts its famous sing-along shows. As I mentioned in a previous post, these shows are a great example of things to do that are completely unique to Austin. I had the opportunity to attend the 1997 Sing-Along last Thursday and had an absolute blast. The idea is basically group karaoke. For about two hours, music videos play on the giant movie screen with words to follow along. You can remain in the audience area and sing to your hearts content, or even get up on the stage in front of the screen and put on your own show. Two hosts guide the crowd through the experience and get everyone excited and involved in the show. Our hosts for the evening dressed the part in 1997 fashion. 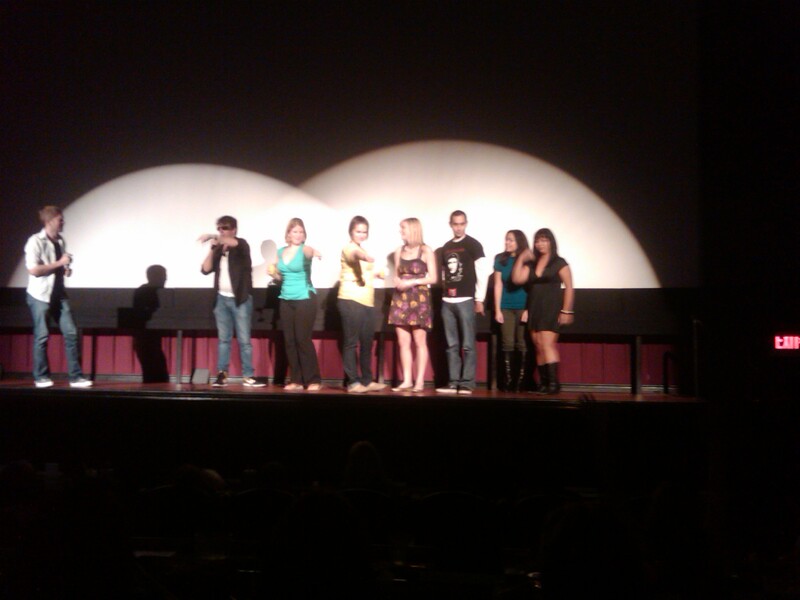 It was my friend’s 21st birthday so they called her up on the stage for a free shot. The birthday girl is standing in the middle wearing a dress. 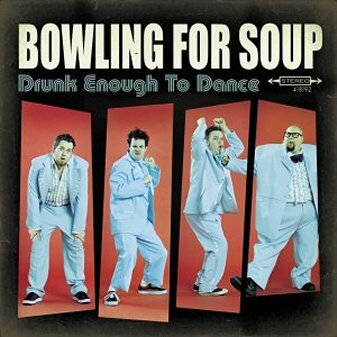 I feel like people tend to forget about this artist when they think of the '90s. I won’t give away the whole playlist, because Alamo still has two more showings for ’90s lovers– tomorrow night at 9:50 pm and next Thursday at 9:45 pm. I recommend purchasing your tickets now online because sing-alongs tend to sell out many hours before their showings. If you miss the 1997 shows, Christmas sing-alongs begin the following week. Not only do you get to sing popular versions of holiday hits, but afterward the audience is invited to carol up and down 6th street, spreading Christmas cheer to all of downtown.